Faces in the Fire is a group show featuring a selection of works including multi media pieces, large charcoal drawings and oil painting from three emerging contemporary artists from Rye in Sussex. 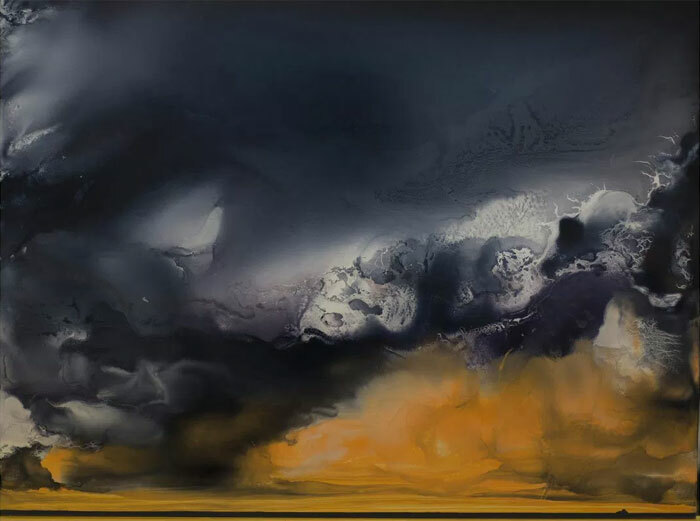 Sarah Seymour’s large dark landscape drawings and oil paintings are both depictions of the storm and also representations of the storm within and invite the viewer to contemplate the question of the subjective and the universal. Jenny Edbrookes glossy multi-media pieces explore the connection between female menstrual cycles and the greater cycles and rhythms of the universe. The beautifully ornate and highly tactile work invites us to contemplate aesthetics as evidence of external meaning. By taking ownership and re-appropriating the traditionally female motif of the flower, Jenny reasserts them as power tools to question gender and identity. Luke Hannam chooses religious iconography as his starting point. The mother and child motif seen routinely throughout the history of art is the trigger for his painterly but also symbolically driven works. Luke wants us to consider the mother and child motif as both an archetype of nurture and sustenance and a depiction of it.